Performed by Clean & Friendly, with Linda Neves, lead vocal, backed by Marilynn Mair, Brinsley Davis, Ellen Santaniello, Nate Davis, Jeremy Woodward, and Mark Davis. Marilynn plays mandolin & mandola. 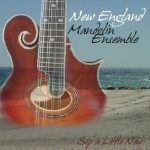 This disc includes jazz, classical, and traditional folk music sounds, and features both intricately-composed and improvised music for four mandolin-family instruments. Enigmatica and Mair & Larrabee are included in this CD of instrumental carols for the holiday season. The Mair-Davis Duo in original arrangements of traditional carols, recorded with string quartet & recorder.